You are all so smart! 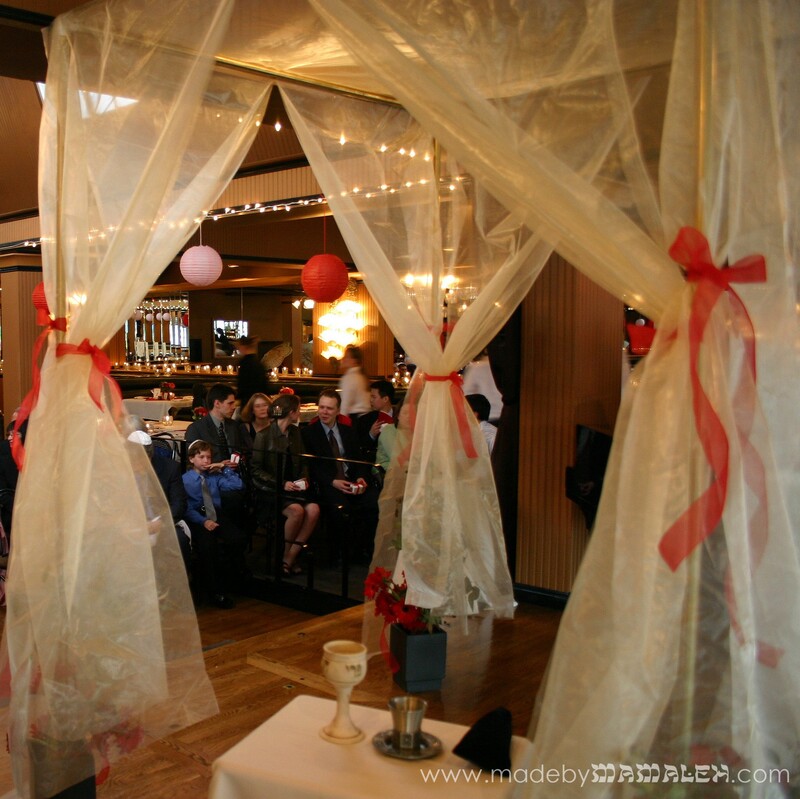 Yes, indeed, when you combine PVC pipes, gold spray paint, yards of organza and iron-on seam tape, you get a lovely, easy-to-make, reasonably priced chuppah! 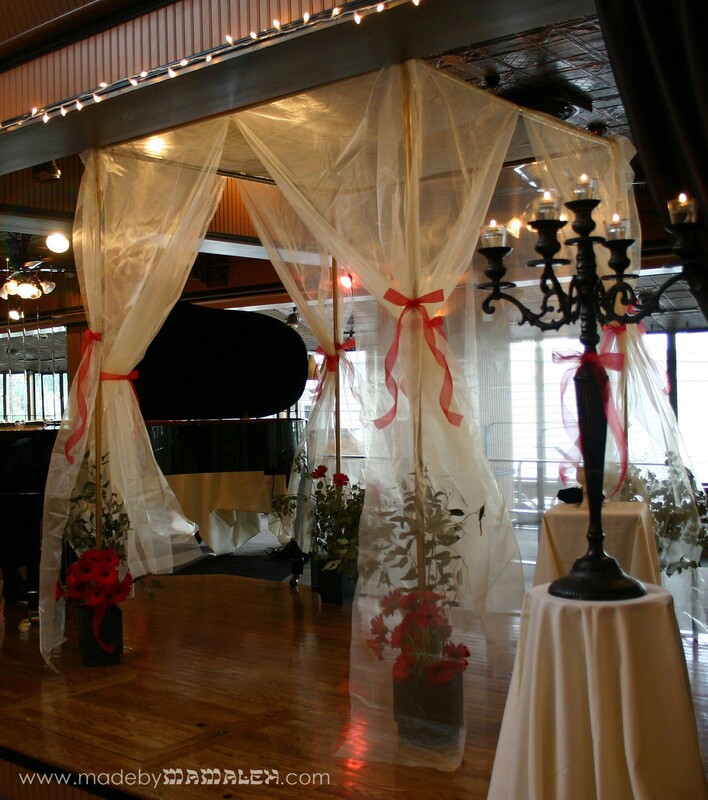 For those that don’t know, a chuppah is a Jewish wedding canopy. It symbolizes the union of two under one roof and stands for their new home together as husband and wife. The chuppah is open on all sides, representing a dwelling in which family and friends will always be welcomed. As for the fabric, the organza was purchased from one of my favorite supply places, Paper Mart, who has terrific selection and prices on packaging and party-prep stuff. Suzanna and I cut a roof and then made four panels that we attached using iron-on seam to tape. We then cut each panel in half so that two smaller panels came together on each pole. It was then tied to the poles using ribbon (in our wedding colors of course). 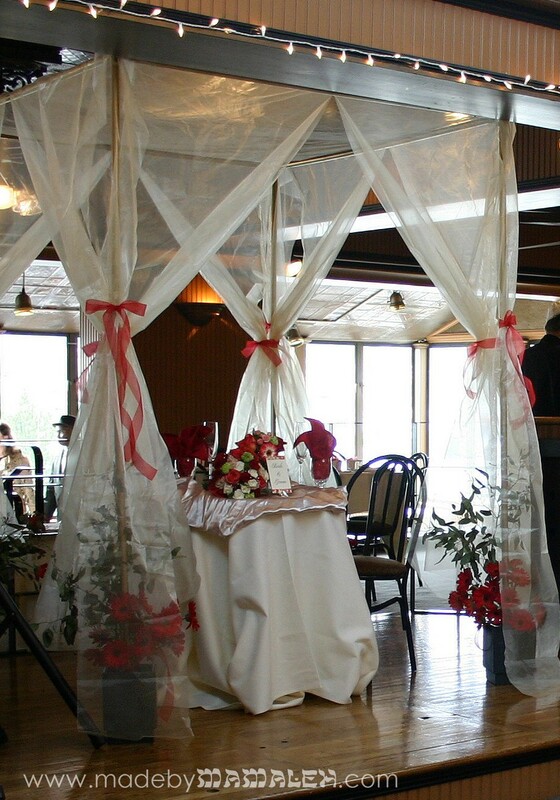 We enjoyed the chuppah even more by putting our sweetheart table underneath after the ceremony! Hope you’ve enjoyed my little trip down memory lane of our fabulous wedding at Lake Union Cafe with these lovely photos of our chuppah taken by Beautiful Endings photography. Happy 6th Anniversary to my mensch of a husband! 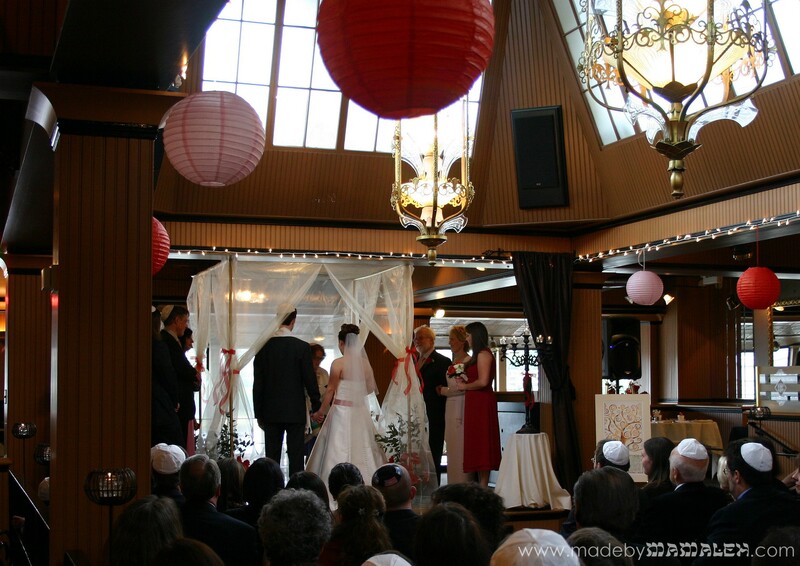 Did you make your own chuppah? What did you use? If you have a picture, and feel like sharing, please do! 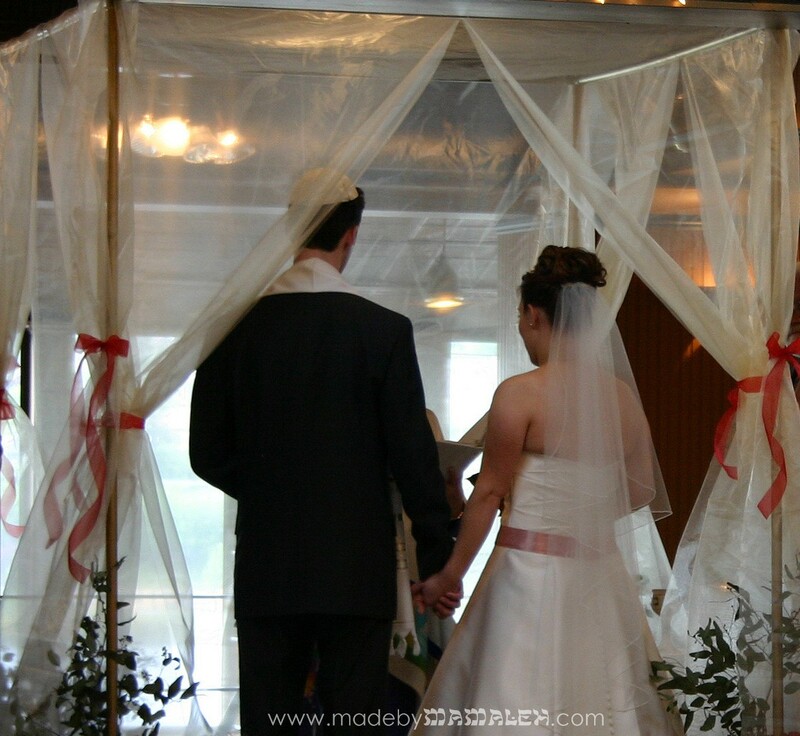 This entry was posted in Chuppah, Wedding and tagged Beautiful Endings, chuppah, Jewish wedding, wedding. Bookmark the permalink. Very elegant! And (sad to say this!) I am drooling over the choice of PVC fittings you have there – I built a sukkah using PVC piping but only had access to a limited range of proper plumbing joints, none of which are designed for nice corners!